Aluminum Wheels, Satellite Radio, iPod/MP3 Input, Bluetooth, Back-Up Camera, Edmunds.com's review says We were surprised by how entertaining and capable this boxy little car is on a twisting road, which translates to a more confident ride for less than sporty drivers.. Base trim. EPA 31 MPG Hwy/26 MPG City! Warranty 10 yrs/100k Miles - Drivetrain Warranty; KEY FEATURES INCLUDE Back-Up Camera, Satellite Radio, iPod/MP3 Input, Bluetooth, Aluminum Wheels MP3 Player, Privacy Glass, Keyless Entry, Steering Wheel Controls, Child Safety Locks. DRIVE WITH CONFIDENCE Owning a Kia means peace of mind--Kia offers an industry-leading: 10-year/100,000-mile limited powertrain warranty; 5-year/60,000-mile limited basic warranty; 5-year/100,000-mile limited anti-perforation warranty; and 5-year/60,000-mile roadside assistance plan. 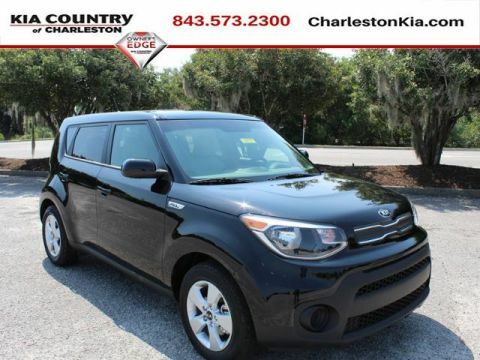 BUY FROM AN AWARD WINNING DEALERSHIP Kia Country of Charleston has earned its reputation for sales and service excellence: Three-time Kia Motors President's Club Award winner and DealerRater.com South Carolina Dealer of the Year (2013, 2014, 2015, 2016) ; 4.9 out of 5 Stars Lifetime Review. FINANCING YOUR NEW CAR Kia Country works with over 30 lenders to secure the most competitive rate for your loan. Complete our online application and get pre-approved for financing or call Internet Sales at 843.573.2300 for more information. Horsepower calculations based on trim engine configuration. Fuel economy calculations based on original manufacturer data for trim engine configuration. Please confirm the accuracy of the included equipment by calling us prior to purchase. IPod/MP3 Input, Bluetooth, CARGO TRAY, CARPETED FLOOR MAT, CARGO NET, Satellite Radio, Back-Up Camera, Aluminum Wheels, Edmunds.com's review says We were surprised by how entertaining and capable this boxy little car is on a twisting road, which translates to a more confident ride for less than sporty drivers.. Base trim, BLACK exterior and GRAY interior. EPA 31 MPG Hwy/26 MPG City! Warranty 10 yrs/100k Miles - Drivetrain Warranty; KEY FEATURES INCLUDE Back-Up Camera, Satellite Radio, iPod/MP3 Input, Bluetooth, Aluminum Wheels MP3 Player, Keyless Entry, Privacy Glass, Steering Wheel Controls, Child Safety Locks. DRIVE WITH CONFIDENCE Owning a Kia means peace of mind--Kia offers an industry-leading: 10-year/100,000-mile limited powertrain warranty; 5-year/60,000-mile limited basic warranty; 5-year/100,000-mile limited anti-perforation warranty; and 5-year/60,000-mile roadside assistance plan. 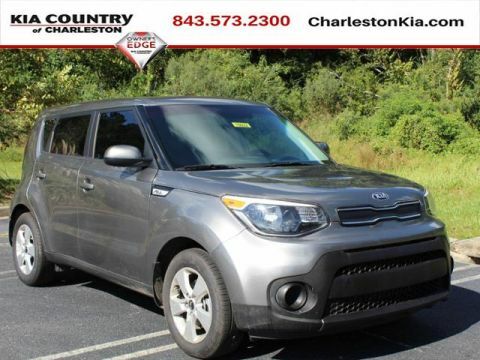 BUY FROM AN AWARD WINNING DEALERSHIP Kia Country of Charleston has earned its reputation for sales and service excellence: Three-time Kia Motors President's Club Award winner and DealerRater.com South Carolina Dealer of the Year (2013, 2014, 2015, 2016) ; 4.9 out of 5 Stars Lifetime Review. FINANCING YOUR NEW CAR Kia Country works with over 30 lenders to secure the most competitive rate for your loan. Complete our online application and get pre-approved for financing or call Internet Sales at 843.573.2300 for more information. Horsepower calculations based on trim engine configuration. Fuel economy calculations based on original manufacturer data for trim engine configuration. Please confirm the accuracy of the included equipment by calling us prior to purchase. Base trim. iPod/MP3 Input, Bluetooth, CARGO TRAY, REAR BUMPER APPLIQUE (CLEAR), CARPETED FLOOR MAT, Satellite Radio, Back-Up Camera, Aluminum Wheels, Edmunds.com explains We were surprised by how entertaining and capable this boxy little car is on a twisting road, which translates to a more confident ride for less than sporty drivers.. EPA 31 MPG Hwy/26 MPG City! Warranty 10 yrs/100k Miles - Drivetrain Warranty; KEY FEATURES INCLUDE Back-Up Camera, Satellite Radio, iPod/MP3 Input, Bluetooth, Aluminum Wheels. MP3 Player, Keyless Entry, Privacy Glass, Steering Wheel Controls, Child Safety Locks. DRIVE WITH CONFIDENCE Owning a Kia means peace of mind--Kia offers an industry-leading: 10-year/100,000-mile limited powertrain warranty; 5-year/60,000-mile limited basic warranty; 5-year/100,000-mile limited anti-perforation warranty; and 5-year/60,000-mile roadside assistance plan. 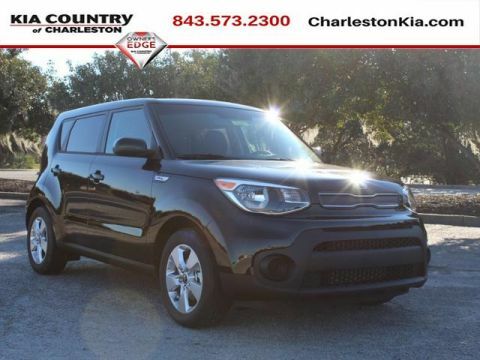 BUY FROM AN AWARD WINNING DEALERSHIP Kia Country of Charleston has earned its reputation for sales and service excellence: Three-time Kia Motors President's Club Award winner and DealerRater.com South Carolina Dealer of the Year (2013, 2014, 2015, 2016) ; 4.9 out of 5 Stars Lifetime Review. FINANCING YOUR NEW CAR Kia Country works with over 30 lenders to secure the most competitive rate for your loan. Complete our online application and get pre-approved for financing or call Internet Sales at 843.573.2300 for more information. Horsepower calculations based on trim engine configuration. Fuel economy calculations based on original manufacturer data for trim engine configuration. Please confirm the accuracy of the included equipment by calling us prior to purchase. Bluetooth, CARPETED FLOOR MAT, Alloy Wheels, Back-Up Camera, iPod/MP3 Input, Satellite Radio, Edmunds.com explains We were surprised by how entertaining and capable this boxy little car is on a twisting road, which translates to a more confident ride for less than sporty drivers.. EPA 31 MPG Hwy/26 MPG City! Base trim, WHITE exterior and GRAY interior. Warranty 10 yrs/100k Miles - Drivetrain Warranty; KEY FEATURES INCLUDE Back-Up Camera, Satellite Radio, iPod/MP3 Input, Bluetooth, Aluminum Wheels MP3 Player, Keyless Entry, Privacy Glass, Steering Wheel Controls, Child Safety Locks. OPTION PACKAGES CARPETED FLOOR MAT. DRIVE WITH CONFIDENCE Owning a Kia means peace of mind--Kia offers an industry-leading: 10-year/100,000-mile limited powertrain warranty; 5-year/60,000-mile limited basic warranty; 5-year/100,000-mile limited anti-perforation warranty; and 5-year/60,000-mile roadside assistance plan. BUY FROM AN AWARD WINNING DEALERSHIP Kia Country of Charleston has earned its reputation for sales and service excellence: Three-time Kia Motors President's Club Award winner and DealerRater.com South Carolina Dealer of the Year (2013, 2014, 2015, 2016) ; 4.9 out of 5 Stars Lifetime Review. FINANCING YOUR NEW CAR Kia Country works with over 30 lenders to secure the most competitive rate for your loan. Complete our online application and get pre-approved for financing or call Internet Sales at 843.573.2300 for more information. Horsepower calculations based on trim engine configuration. Fuel economy calculations based on original manufacturer data for trim engine configuration. Please confirm the accuracy of the included equipment by calling us prior to purchase. IPod/MP3 Input, Bluetooth, Aluminum Wheels, CARPETED FLOOR MAT, EC MIRROR W/HOMELINK & COMPASS, Satellite Radio, Back-Up Camera, We were surprised by how entertaining and capable this boxy little car is on a twisting road, which translates to a more confident ride for less than sporty drivers. -Edmunds.com. BLACK exterior and GRAY interior, Base trim. FUEL EFFICIENT 31 MPG Hwy/26 MPG City! Warranty 10 yrs/100k Miles - Drivetrain Warranty; KEY FEATURES INCLUDE Back-Up Camera, Satellite Radio, iPod/MP3 Input, Bluetooth, Aluminum Wheels. MP3 Player, Keyless Entry, Privacy Glass, Steering Wheel Controls DRIVE WITH CONFIDENCE Owning a Kia means peace of mind--Kia offers an industry-leading: 10-year/100,000-mile limited powertrain warranty; 5-year/60,000-mile limited basic warranty; 5-year/100,000-mile limited anti-perforation warranty; and 5-year/60,000-mile roadside assistance plan. 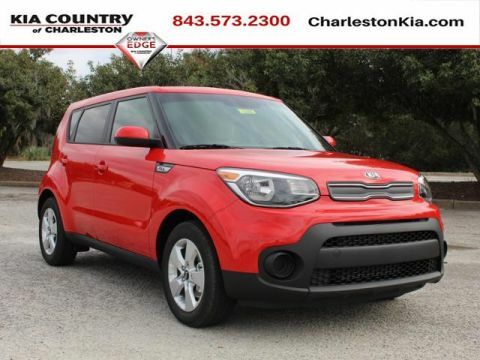 BUY FROM AN AWARD WINNING DEALERSHIP Kia Country of Charleston has earned its reputation for sales and service excellence: Three-time Kia Motors President's Club Award winner and DealerRater.com South Carolina Dealer of the Year (2013, 2014, 2015, 2016) ; 4.9 out of 5 Stars Lifetime Review. FINANCING YOUR NEW CAR Kia Country works with over 30 lenders to secure the most competitive rate for your loan. Complete our online application and get pre-approved for financing or call Internet Sales at 843.573.2300 for more information. Horsepower calculations based on trim engine configuration. Fuel economy calculations based on original manufacturer data for trim engine configuration. Please confirm the accuracy of the included equipment by calling us prior to purchase. Base trim. EPA 31 MPG Hwy/26 MPG City! Bluetooth, EC MIRROR W/HOMELINK & COMPASS, Aluminum Wheels, Back-Up Camera, iPod/MP3 Input, Satellite Radio, Edmunds.com explains We were surprised by how entertaining and capable this boxy little car is on a twisting road, which translates to a more confident ride for less than sporty drivers.. Warranty 10 yrs/100k Miles - Drivetrain Warranty; KEY FEATURES INCLUDE Back-Up Camera, Satellite Radio, iPod/MP3 Input, Bluetooth, Aluminum Wheels. MP3 Player, Privacy Glass, Keyless Entry, Child Safety Locks, Steering Wheel Controls. OPTION PACKAGES EC MIRROR W/HOMELINK & COMPASS. DRIVE WITH CONFIDENCE Owning a Kia means peace of mind--Kia offers an industry-leading: 10-year/100,000-mile limited powertrain warranty; 5-year/60,000-mile limited basic warranty; 5-year/100,000-mile limited anti-perforation warranty; and 5-year/60,000-mile roadside assistance plan. BUY FROM AN AWARD WINNING DEALERSHIP Kia Country of Charleston has earned its reputation for sales and service excellence: Three-time Kia Motors President's Club Award winner and DealerRater.com South Carolina Dealer of the Year (2013, 2014, 2015, 2016) ; 4.9 out of 5 Stars Lifetime Review. FINANCING YOUR NEW CAR Kia Country works with over 30 lenders to secure the most competitive rate for your loan. Complete our online application and get pre-approved for financing or call Internet Sales at 843.573.2300 for more information. Horsepower calculations based on trim engine configuration. Fuel economy calculations based on original manufacturer data for trim engine configuration. Please confirm the accuracy of the included equipment by calling us prior to purchase. FUEL EFFICIENT 31 MPG Hwy/26 MPG City! Bluetooth, iPod/MP3 Input, CARPETED FLOOR MAT, EC MIRROR W/HOMELINK & COMPASS, Aluminum Wheels, Satellite Radio, Back-Up Camera, Edmunds.com explains We were surprised by how entertaining and capable this boxy little car is on a twisting road, which translates to a more confident ride for less than sporty drivers.. Base trim, RED exterior and GRAY interior. Warranty 10 yrs/100k Miles - Drivetrain Warranty; KEY FEATURES INCLUDE Back-Up Camera, Satellite Radio, iPod/MP3 Input, Bluetooth, Aluminum Wheels. MP3 Player, Keyless Entry, Privacy Glass, Steering Wheel Controls DRIVE WITH CONFIDENCE Owning a Kia means peace of mind--Kia offers an industry-leading: 10-year/100,000-mile limited powertrain warranty; 5-year/60,000-mile limited basic warranty; 5-year/100,000-mile limited anti-perforation warranty; and 5-year/60,000-mile roadside assistance plan. 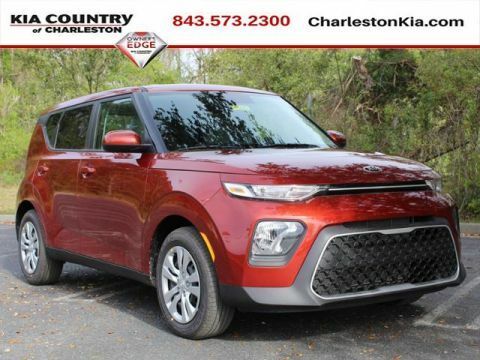 BUY FROM AN AWARD WINNING DEALERSHIP Kia Country of Charleston has earned its reputation for sales and service excellence: Three-time Kia Motors President's Club Award winner and DealerRater.com South Carolina Dealer of the Year (2013, 2014, 2015, 2016) ; 4.9 out of 5 Stars Lifetime Review. FINANCING YOUR NEW CAR Kia Country works with over 30 lenders to secure the most competitive rate for your loan. Complete our online application and get pre-approved for financing or call Internet Sales at 843.573.2300 for more information. Horsepower calculations based on trim engine configuration. Fuel economy calculations based on original manufacturer data for trim engine configuration. Please confirm the accuracy of the included equipment by calling us prior to purchase. Bluetooth, iPod/MP3 Input, CARPETED FLOOR MAT, EC MIRROR W/HOMELINK & COMPASS, Alloy Wheels, Satellite Radio, Back-Up Camera, We were surprised by how entertaining and capable this boxy little car is on a twisting road, which translates to a more confident ride for less than sporty drivers. -Edmunds.com. Base trim, BLACK exterior and GRAY interior. EPA 31 MPG Hwy/26 MPG City! Warranty 10 yrs/100k Miles - Drivetrain Warranty; KEY FEATURES INCLUDE Back-Up Camera, Satellite Radio, iPod/MP3 Input, Bluetooth, Aluminum Wheels MP3 Player, Keyless Entry, Privacy Glass, Steering Wheel Controls, Child Safety Locks. DRIVE WITH CONFIDENCE Owning a Kia means peace of mind--Kia offers an industry-leading: 10-year/100,000-mile limited powertrain warranty; 5-year/60,000-mile limited basic warranty; 5-year/100,000-mile limited anti-perforation warranty; and 5-year/60,000-mile roadside assistance plan. 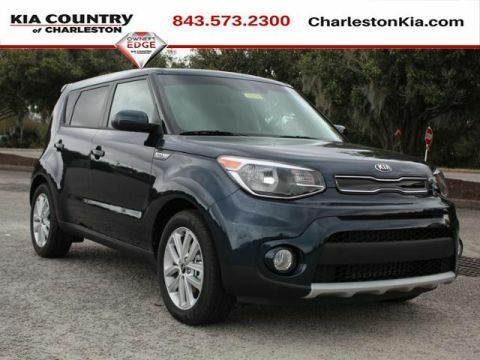 BUY FROM AN AWARD WINNING DEALERSHIP Kia Country of Charleston has earned its reputation for sales and service excellence: Three-time Kia Motors President's Club Award winner and DealerRater.com South Carolina Dealer of the Year (2013, 2014, 2015, 2016) ; 4.9 out of 5 Stars Lifetime Review. FINANCING YOUR NEW CAR Kia Country works with over 30 lenders to secure the most competitive rate for your loan. Complete our online application and get pre-approved for financing or call Internet Sales at 843.573.2300 for more information. Horsepower calculations based on trim engine configuration. Fuel economy calculations based on original manufacturer data for trim engine configuration. Please confirm the accuracy of the included equipment by calling us prior to purchase. CROSS BARS, CARPETED FLOOR MAT, Aluminum Wheels, CONVENIENCE PACKAGE, Edmunds.com explains We were surprised by how entertaining and capable this boxy little car is on a twisting road, which translates to a more confident ride for less than sporty drivers.. Base trim, FUEL EFFICIENT 31 MPG Hwy/26 MPG City! Warranty 10 yrs/100k Miles - Drivetrain Warranty; KEY FEATURES INCLUDE Aluminum Wheels Privacy Glass, Keyless Entry, Child Safety Locks, Electronic Stability Control, Bucket Seats. OPTION PACKAGES CONVENIENCE PACKAGE Automatic A/C Temperature Control, cluster ionizer DRIVE WITH CONFIDENCE Owning a Kia means peace of mind--Kia offers an industry-leading: 10-year/100,000-mile limited powertrain warranty; 5-year/60,000-mile limited basic warranty; 5-year/100,000-mile limited anti-perforation warranty; and 5-year/60,000-mile roadside assistance plan. BUY FROM AN AWARD WINNING DEALERSHIP Kia Country of Charleston has earned its reputation for sales and service excellence: Three-time Kia Motors President's Club Award winner and DealerRater.com South Carolina Dealer of the Year (2013, 2014, 2015, 2016) ; 4.9 out of 5 Stars Lifetime Review. FINANCING YOUR NEW CAR Kia Country works with over 30 lenders to secure the most competitive rate for your loan. Complete our online application and get pre-approved for financing or call Internet Sales at 843.573.2300 for more information. Horsepower calculations based on trim engine configuration. Fuel economy calculations based on original manufacturer data for trim engine configuration. Please confirm the accuracy of the included equipment by calling us prior to purchase. Base trim, CONVENIENCE PACKAGE, EC MIRROR W/HOMELINK & COMPASS, Aluminum Wheels, CARPETED FLOOR MAT, Edmunds.com's review says We were surprised by how entertaining and capable this boxy little car is on a twisting road, which translates to a more confident ride for less than sporty drivers.. EPA 31 MPG Hwy/26 MPG City! Warranty 10 yrs/100k Miles - Drivetrain Warranty; KEY FEATURES INCLUDE Aluminum Wheels. Privacy Glass, Keyless Entry, Child Safety Locks, Electronic Stability Control, Bucket Seats. OPTION PACKAGES CONVENIENCE PACKAGE Automatic A/C Temperature Control, cluster ionizer DRIVE WITH CONFIDENCE Owning a Kia means peace of mind--Kia offers an industry-leading: 10-year/100,000-mile limited powertrain warranty; 5-year/60,000-mile limited basic warranty; 5-year/100,000-mile limited anti-perforation warranty; and 5-year/60,000-mile roadside assistance plan. BUY FROM AN AWARD WINNING DEALERSHIP Kia Country of Charleston has earned its reputation for sales and service excellence: Three-time Kia Motors President's Club Award winner and DealerRater.com South Carolina Dealer of the Year (2013, 2014, 2015, 2016) ; 4.9 out of 5 Stars Lifetime Review. FINANCING YOUR NEW CAR Kia Country works with over 30 lenders to secure the most competitive rate for your loan. Complete our online application and get pre-approved for financing or call Internet Sales at 843.573.2300 for more information. Horsepower calculations based on trim engine configuration. Fuel economy calculations based on original manufacturer data for trim engine configuration. Please confirm the accuracy of the included equipment by calling us prior to purchase. CARPETED FLOOR MAT, CONVENIENCE PACKAGE, Alloy Wheels, EC MIRROR W/HOMELINK & COMPASS, Edmunds.com explains We were surprised by how entertaining and capable this boxy little car is on a twisting road, which translates to a more confident ride for less than sporty drivers.. Base trim, Shadow Black exterior and Black interior. FUEL EFFICIENT 31 MPG Hwy/26 MPG City! Warranty 10 yrs/100k Miles - Drivetrain Warranty; KEY FEATURES INCLUDE Aluminum Wheels. Privacy Glass, Keyless Entry, Child Safety Locks, Electronic Stability Control, Bucket Seats. OPTION PACKAGES CONVENIENCE PACKAGE Automatic A/C Temperature Control DRIVE WITH CONFIDENCE Owning a Kia means peace of mind--Kia offers an industry-leading: 10-year/100,000-mile limited powertrain warranty; 5-year/60,000-mile limited basic warranty; 5-year/100,000-mile limited anti-perforation warranty; and 5-year/60,000-mile roadside assistance plan. BUY FROM AN AWARD WINNING DEALERSHIP Kia Country of Charleston has earned its reputation for sales and service excellence: Three-time Kia Motors President's Club Award winner and DealerRater.com South Carolina Dealer of the Year (2013, 2014, 2015, 2016) ; 4.9 out of 5 Stars Lifetime Review. FINANCING YOUR NEW CAR Kia Country works with over 30 lenders to secure the most competitive rate for your loan. Complete our online application and get pre-approved for financing or call Internet Sales at 843.573.2300 for more information. Horsepower calculations based on trim engine configuration. Fuel economy calculations based on original manufacturer data for trim engine configuration. Please confirm the accuracy of the included equipment by calling us prior to purchase. Base trim. FUEL EFFICIENT 31 MPG Hwy/26 MPG City! CARPETED FLOOR MAT, CONVENIENCE PACKAGE, Aluminum Wheels, EC MIRROR W/HOMELINK & COMPASS, We were surprised by how entertaining and capable this boxy little car is on a twisting road, which translates to a more confident ride for less than sporty drivers. -Edmunds.com. Warranty 10 yrs/100k Miles - Drivetrain Warranty; KEY FEATURES INCLUDE Aluminum Wheels Privacy Glass, Keyless Entry, Child Safety Locks, Electronic Stability Control, Bucket Seats. OPTION PACKAGES CONVENIENCE PACKAGE Automatic A/C Temperature Control, cluster ionizer DRIVE WITH CONFIDENCE Owning a Kia means peace of mind--Kia offers an industry-leading: 10-year/100,000-mile limited powertrain warranty; 5-year/60,000-mile limited basic warranty; 5-year/100,000-mile limited anti-perforation warranty; and 5-year/60,000-mile roadside assistance plan. BUY FROM AN AWARD WINNING DEALERSHIP Kia Country of Charleston has earned its reputation for sales and service excellence: Three-time Kia Motors President's Club Award winner and DealerRater.com South Carolina Dealer of the Year (2013, 2014, 2015, 2016) ; 4.9 out of 5 Stars Lifetime Review. FINANCING YOUR NEW CAR Kia Country works with over 30 lenders to secure the most competitive rate for your loan. Complete our online application and get pre-approved for financing or call Internet Sales at 843.573.2300 for more information. Horsepower calculations based on trim engine configuration. Fuel economy calculations based on original manufacturer data for trim engine configuration. Please confirm the accuracy of the included equipment by calling us prior to purchase. Base trim, EPA 31 MPG Hwy/26 MPG City! EC MIRROR W/HOMELINK & COMPASS, CONVENIENCE PACKAGE, CARPETED FLOOR MAT, Aluminum Wheels, Edmunds.com explains We were surprised by how entertaining and capable this boxy little car is on a twisting road, which translates to a more confident ride for less than sporty drivers.. Warranty 10 yrs/100k Miles - Drivetrain Warranty; KEY FEATURES INCLUDE Aluminum Wheels Privacy Glass, Keyless Entry, Child Safety Locks, Electronic Stability Control, Bucket Seats. OPTION PACKAGES CONVENIENCE PACKAGE Automatic A/C Temperature Control, cluster ionizer DRIVE WITH CONFIDENCE Owning a Kia means peace of mind--Kia offers an industry-leading: 10-year/100,000-mile limited powertrain warranty; 5-year/60,000-mile limited basic warranty; 5-year/100,000-mile limited anti-perforation warranty; and 5-year/60,000-mile roadside assistance plan. 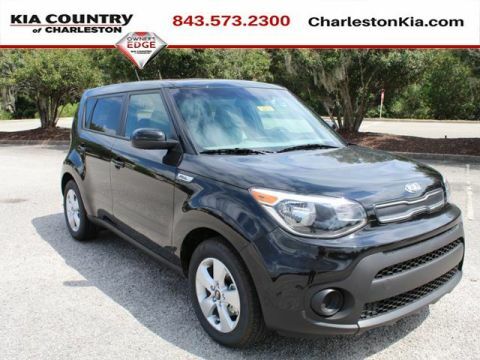 BUY FROM AN AWARD WINNING DEALERSHIP Kia Country of Charleston has earned its reputation for sales and service excellence: Three-time Kia Motors President's Club Award winner and DealerRater.com South Carolina Dealer of the Year (2013, 2014, 2015, 2016) ; 4.9 out of 5 Stars Lifetime Review. FINANCING YOUR NEW CAR Kia Country works with over 30 lenders to secure the most competitive rate for your loan. Complete our online application and get pre-approved for financing or call Internet Sales at 843.573.2300 for more information. Horsepower calculations based on trim engine configuration. Fuel economy calculations based on original manufacturer data for trim engine configuration. Please confirm the accuracy of the included equipment by calling us prior to purchase. FUEL EFFICIENT 31 MPG Hwy/26 MPG City! CARPETED FLOOR MAT, CONVENIENCE PACKAGE, EC MIRROR W/HOMELINK & COMPASS, Aluminum Wheels, Edmunds.com explains We were surprised by how entertaining and capable this boxy little car is on a twisting road, which translates to a more confident ride for less than sporty drivers.. Base trim, Warranty 10 yrs/100k Miles - Drivetrain Warranty; KEY FEATURES INCLUDE Aluminum Wheels Privacy Glass, Keyless Entry, Child Safety Locks, Electronic Stability Control, Bucket Seats. OPTION PACKAGES CONVENIENCE PACKAGE Automatic A/C Temperature Control DRIVE WITH CONFIDENCE Owning a Kia means peace of mind--Kia offers an industry-leading: 10-year/100,000-mile limited powertrain warranty; 5-year/60,000-mile limited basic warranty; 5-year/100,000-mile limited anti-perforation warranty; and 5-year/60,000-mile roadside assistance plan. 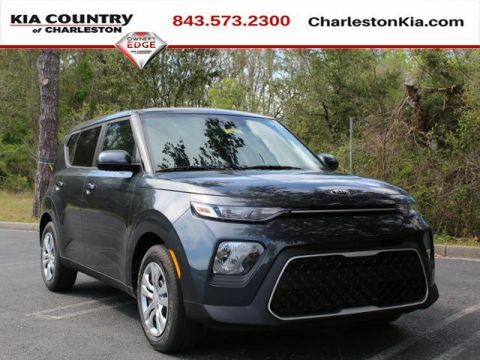 BUY FROM AN AWARD WINNING DEALERSHIP Kia Country of Charleston has earned its reputation for sales and service excellence: Three-time Kia Motors President's Club Award winner and DealerRater.com South Carolina Dealer of the Year (2013, 2014, 2015, 2016) ; 4.9 out of 5 Stars Lifetime Review. FINANCING YOUR NEW CAR Kia Country works with over 30 lenders to secure the most competitive rate for your loan. Complete our online application and get pre-approved for financing or call Internet Sales at 843.573.2300 for more information. Horsepower calculations based on trim engine configuration. Fuel economy calculations based on original manufacturer data for trim engine configuration. Please confirm the accuracy of the included equipment by calling us prior to purchase. CARPETED FLOOR MAT, CONVENIENCE PACKAGE, Aluminum Wheels, EC MIRROR W/HOMELINK & COMPASS, We were surprised by how entertaining and capable this boxy little car is on a twisting road, which translates to a more confident ride for less than sporty drivers. -Edmunds.com. Base trim. EPA 31 MPG Hwy/26 MPG City! Warranty 10 yrs/100k Miles - Drivetrain Warranty; KEY FEATURES INCLUDE Aluminum Wheels. Privacy Glass, Keyless Entry, Child Safety Locks, Electronic Stability Control, Bucket Seats. OPTION PACKAGES CONVENIENCE PACKAGE Automatic A/C Temperature Control, cluster ionizer DRIVE WITH CONFIDENCE Owning a Kia means peace of mind--Kia offers an industry-leading: 10-year/100,000-mile limited powertrain warranty; 5-year/60,000-mile limited basic warranty; 5-year/100,000-mile limited anti-perforation warranty; and 5-year/60,000-mile roadside assistance plan. 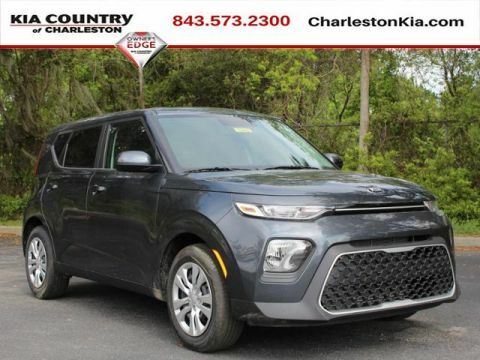 BUY FROM AN AWARD WINNING DEALERSHIP Kia Country of Charleston has earned its reputation for sales and service excellence: Three-time Kia Motors President's Club Award winner and DealerRater.com South Carolina Dealer of the Year (2013, 2014, 2015, 2016) ; 4.9 out of 5 Stars Lifetime Review. FINANCING YOUR NEW CAR Kia Country works with over 30 lenders to secure the most competitive rate for your loan. Complete our online application and get pre-approved for financing or call Internet Sales at 843.573.2300 for more information. Horsepower calculations based on trim engine configuration. Fuel economy calculations based on original manufacturer data for trim engine configuration. Please confirm the accuracy of the included equipment by calling us prior to purchase. Onboard Communications System, Smart Device Integration, Aluminum Wheels, CARPETED FLOOR MAT, REAR SPOILER (SP), iPod/MP3 Input, Satellite Radio, Back-Up Camera, Edmunds.com explains We were surprised by how entertaining and capable this boxy little car is on a twisting road, which translates to a more confident ride for less than sporty drivers.. + trim, EPA 30 MPG Hwy/25 MPG City! Warranty 10 yrs/100k Miles - Drivetrain Warranty; KEY FEATURES INCLUDE Back-Up Camera, Satellite Radio, iPod/MP3 Input, Onboard Communications System, Aluminum Wheels, Smart Device Integration MP3 Player DRIVE WITH CONFIDENCE Owning a Kia means peace of mind--Kia offers an industry-leading: 10-year/100,000-mile limited powertrain warranty; 5-year/60,000-mile limited basic warranty; 5-year/100,000-mile limited anti-perforation warranty; and 5-year/60,000-mile roadside assistance plan. 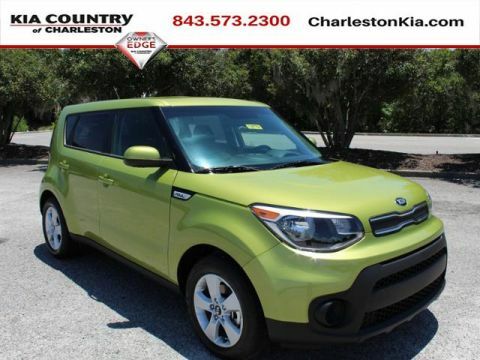 BUY FROM AN AWARD WINNING DEALERSHIP Kia Country of Charleston has earned its reputation for sales and service excellence: Three-time Kia Motors President's Club Award winner and DealerRater.com South Carolina Dealer of the Year (2013, 2014, 2015, 2016) ; 4.9 out of 5 Stars Lifetime Review. FINANCING YOUR NEW CAR Kia Country works with over 30 lenders to secure the most competitive rate for your loan. Complete our online application and get pre-approved for financing or call Internet Sales at 843.573.2300 for more information. Horsepower calculations based on trim engine configuration. Fuel economy calculations based on original manufacturer data for trim engine configuration. Please confirm the accuracy of the included equipment by calling us prior to purchase. Smart Device Integration, CARPETED FLOOR MATS, CARGO NET, Back-Up Camera, Bluetooth, iPod/MP3 Input. FUEL EFFICIENT 33 MPG Hwy/27 MPG City! LX trim. Warranty 10 yrs/100k Miles - Drivetrain Warranty; KEY FEATURES INCLUDE Back-Up Camera, iPod/MP3 Input, Bluetooth, Smart Device Integration. MP3 Player, Privacy Glass, Keyless Entry, Child Safety Locks, Steering Wheel Controls. OPTION PACKAGES CARPETED FLOOR MATS, CARGO NET. Kia LX with GREY exterior and BLACK interior features a 4 Cylinder Engine with 147 HP at 6200 RPM*. DRIVE WITH CONFIDENCE Owning a Kia means peace of mind--Kia offers an industry-leading: 10-year/100,000-mile limited powertrain warranty; 5-year/60,000-mile limited basic warranty; 5-year/100,000-mile limited anti-perforation warranty; and 5-year/60,000-mile roadside assistance plan. BUY FROM AN AWARD WINNING DEALERSHIP Kia Country of Charleston has earned its reputation for sales and service excellence: Three-time Kia Motors President's Club Award winner and DealerRater.com South Carolina Dealer of the Year (2013, 2014, 2015, 2016) ; 4.9 out of 5 Stars Lifetime Review. FINANCING YOUR NEW CAR Kia Country works with over 30 lenders to secure the most competitive rate for your loan. Complete our online application and get pre-approved for financing or call Internet Sales at 843.573.2300 for more information. Horsepower calculations based on trim engine configuration. Fuel economy calculations based on original manufacturer data for trim engine configuration. Please confirm the accuracy of the included equipment by calling us prior to purchase. EPA 33 MPG Hwy/27 MPG City! Smart Device Integration, CARPETED FLOOR MATS, Back-Up Camera, Bluetooth, iPod/MP3 Input. LX trim, GREY exterior and BLACK/GRAY interior. Warranty 10 yrs/100k Miles - Drivetrain Warranty; KEY FEATURES INCLUDE Back-Up Camera, iPod/MP3 Input, Bluetooth, Smart Device Integration. MP3 Player, Privacy Glass, Keyless Entry, Child Safety Locks, Steering Wheel Controls. OPTION PACKAGES CARPETED FLOOR MATS. Kia LX with GREY exterior and BLACK/GRAY interior features a 4 Cylinder Engine with 147 HP at 6200 RPM*. DRIVE WITH CONFIDENCE Owning a Kia means peace of mind--Kia offers an industry-leading: 10-year/100,000-mile limited powertrain warranty; 5-year/60,000-mile limited basic warranty; 5-year/100,000-mile limited anti-perforation warranty; and 5-year/60,000-mile roadside assistance plan. BUY FROM AN AWARD WINNING DEALERSHIP Kia Country of Charleston has earned its reputation for sales and service excellence: Three-time Kia Motors President's Club Award winner and DealerRater.com South Carolina Dealer of the Year (2013, 2014, 2015, 2016) ; 4.9 out of 5 Stars Lifetime Review. FINANCING YOUR NEW CAR Kia Country works with over 30 lenders to secure the most competitive rate for your loan. Complete our online application and get pre-approved for financing or call Internet Sales at 843.573.2300 for more information. Horsepower calculations based on trim engine configuration. Fuel economy calculations based on original manufacturer data for trim engine configuration. Please confirm the accuracy of the included equipment by calling us prior to purchase. Smart Device Integration, REAR BUMPER APPLIQUE, CARPETED FLOOR MATS, Back-Up Camera, Bluetooth, iPod/MP3 Input. LX trim. FUEL EFFICIENT 33 MPG Hwy/27 MPG City! Warranty 10 yrs/100k Miles - Drivetrain Warranty; KEY FEATURES INCLUDE Back-Up Camera, iPod/MP3 Input, Bluetooth, Smart Device Integration MP3 Player, Privacy Glass, Keyless Entry, Child Safety Locks, Steering Wheel Controls. OPTION PACKAGES CARPETED FLOOR MATS, REAR BUMPER APPLIQUE. Kia LX with GREY exterior and BLACK/GRAY interior features a 4 Cylinder Engine with 147 HP at 6200 RPM*. DRIVE WITH CONFIDENCE Owning a Kia means peace of mind--Kia offers an industry-leading: 10-year/100,000-mile limited powertrain warranty; 5-year/60,000-mile limited basic warranty; 5-year/100,000-mile limited anti-perforation warranty; and 5-year/60,000-mile roadside assistance plan. 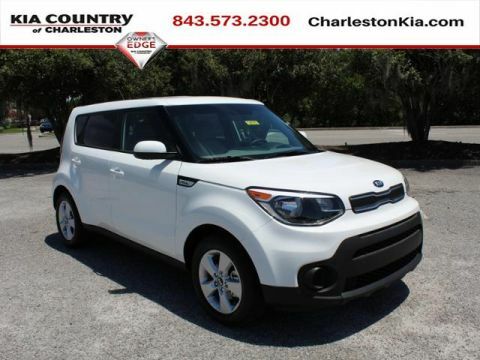 BUY FROM AN AWARD WINNING DEALERSHIP Kia Country of Charleston has earned its reputation for sales and service excellence: Three-time Kia Motors President's Club Award winner and DealerRater.com South Carolina Dealer of the Year (2013, 2014, 2015, 2016) ; 4.9 out of 5 Stars Lifetime Review. FINANCING YOUR NEW CAR Kia Country works with over 30 lenders to secure the most competitive rate for your loan. Complete our online application and get pre-approved for financing or call Internet Sales at 843.573.2300 for more information. Horsepower calculations based on trim engine configuration. Fuel economy calculations based on original manufacturer data for trim engine configuration. Please confirm the accuracy of the included equipment by calling us prior to purchase. Smart Device Integration, REAR BUMPER APPLIQUE, CARPETED FLOOR MATS, Back-Up Camera, Bluetooth, iPod/MP3 Input. LX trim, ORANGE exterior and BLACK/GRAY interior. FUEL EFFICIENT 33 MPG Hwy/27 MPG City! Warranty 10 yrs/100k Miles - Drivetrain Warranty; KEY FEATURES INCLUDE Back-Up Camera, iPod/MP3 Input, Bluetooth, Smart Device Integration MP3 Player, Privacy Glass, Keyless Entry, Child Safety Locks, Steering Wheel Controls. OPTION PACKAGES CARPETED FLOOR MATS, REAR BUMPER APPLIQUE. Kia LX with ORANGE exterior and BLACK/GRAY interior features a 4 Cylinder Engine with 147 HP at 6200 RPM*. DRIVE WITH CONFIDENCE Owning a Kia means peace of mind--Kia offers an industry-leading: 10-year/100,000-mile limited powertrain warranty; 5-year/60,000-mile limited basic warranty; 5-year/100,000-mile limited anti-perforation warranty; and 5-year/60,000-mile roadside assistance plan. BUY FROM AN AWARD WINNING DEALERSHIP Kia Country of Charleston has earned its reputation for sales and service excellence: Three-time Kia Motors President's Club Award winner and DealerRater.com South Carolina Dealer of the Year (2013, 2014, 2015, 2016) ; 4.9 out of 5 Stars Lifetime Review. FINANCING YOUR NEW CAR Kia Country works with over 30 lenders to secure the most competitive rate for your loan. Complete our online application and get pre-approved for financing or call Internet Sales at 843.573.2300 for more information. Horsepower calculations based on trim engine configuration. Fuel economy calculations based on original manufacturer data for trim engine configuration. Please confirm the accuracy of the included equipment by calling us prior to purchase.